Tire choices should depend on more than just the tire. For one thing, you are going to have to think about the overall environment as well as the climate of the area you are in. For another thing, you have to make sure that the environment calls for the type of tires you are going to buy. One thing to consider is that it does not get very cold everywhere. Therefore, you might not need winter tires in some areas. 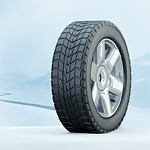 You could do well in all season tires. However, in areas where it gets cold enough, you can use winter tires, especially where it snows. In warm weather, you will need to swap out your tires to a set more suitable for the conditions you will travel on. It's bad for your tires and the roads that you travel on to use winter tires in other seasons.